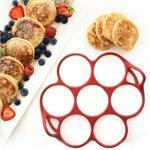 These non-stick egg and pancake rings add a bit of whimsy to your breakfast table. Simply give the ring a spritz with cooking oil and place on a seasoned, preheated griddle. 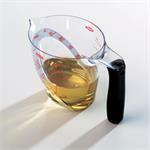 Pour in your pancake batter & remove the ring when your pancake is ready to flip. 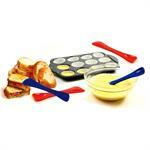 Lift, stir, turn, mix or serve many food preparations with this versatile turner. Easily maneuvers in small spaces such as microwaves and toaster ovens. Comfortable to hold handle with an indented thumb grip fits naturally in your hands. 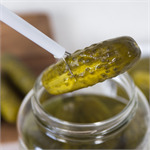 The pickle pincher easily grabs pickles, olives and antipasto from jars and containers. Just simply press down on the top plunger to open the tongs and release to close. It also works great for cocktail onions and maraschino cherries. 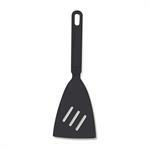 This easy to use, 10" long tool features an angled, scraper end and a slightly rounded scoop end. 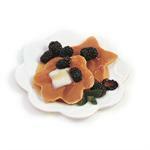 Reach deep to clean out jars, scrape a bowl clean, stir a sauce, spread condiments, frost desserts, and more. Dishwasher safe silicone over rigid nylon. Make stacks of perfect little pancakes. Each silicone ring holds 1 tablespoon of batter or 1 small egg, the perfect size for stacking or making an english muffin breakfast sandwich. 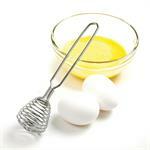 Use with brownie or cake batter and stack them with whipped cream. 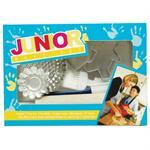 No ordinary colander! 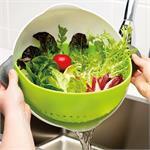 The ingenious two piece design lets you wash, soak, strain and drain vegetables, berries, greens etc. 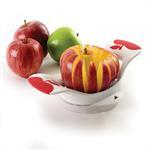 The inner colander bowl, is attached at each side to the outer bowl such that it can swing freely. A Saskatchewan Product! 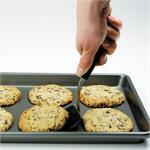 Never be without a buddy, the Bakeware Buddy safely cuts on non-stick bakeware without scratching or damaging the non-stick coating. 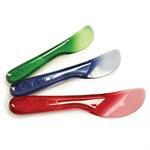 This durable plastic knife is dishwasher safe. 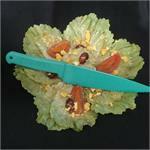 The Original Lettuce Knife is a Saskatchewan made product. Easily cuts through lettuce without causing oxidization and browning. 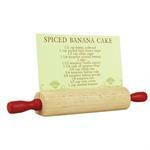 Will also cut through soft loaves and will not scratch your non-stick surfaces.